I’ve used online file backup services for longer than I can remember – way before people called them “cloud backup services”. In fact, I’ve forgotten half of the backup services I’ve tried in the past. I even went as far as uploading my files to a secure FTP site because I couldn’t find any online file backup service that actually worked. Every product I tried struggled with firewalls or anti-virus software, stopped uploading or went out of business. I really wanted a solution to my problem, but nothing came close. And then in 2006 I found Mozy, and just fell in love with it. I saw the reviews that were critical of the idea of “reticulating splines” (still no idea what that means), and that Carbonite and other products were far superior. In fact, there almost appeared to be a bias towards Carbonite in the tech media. Just one glowing review after another, despite the fact that the average child could see Carbonite just wasn’t up to scratch. But Mozy had a secret weapon – it worked really well. I didn’t have to go poking and prodding it or worry that it would miss a backup or crash my PC. I think I had one serious technical problem (software update) in my 13 years of using Mozy, and that was fixed with an overnight patch. A backup would stall because of an open or locked file, or some other random problem, but they were so rare I didn’t care. So, no matter what all those “reviews” of Carbonite actually said, Mozy was the clear winner for me and tens of thousands of other users. But then we saw what often happens in tech when Company A can’t compete with Company B – a buyout. They’re not smart enough to create a better product, so they just raise a pile of capital and buy out the competitor instead. So, Mozy was acquired by Carbonite in 2018, and now in early 2019, I’m going through the migration process. Don’t get me wrong – Carbonite is okay, but only barely “okay”. I never rated it as a backup service, and now after using it for a few days, I can see why they had to acquire Mozy – they were never going to catch up to it. I evaluated Carbonite over a decade ago, and absolutely hated it back then. It was horribly slow and struggled to complete backups. Nothing about it appealed to me then, and I find myself in the same position today. And they’re just the flaws I’ve come across so far. 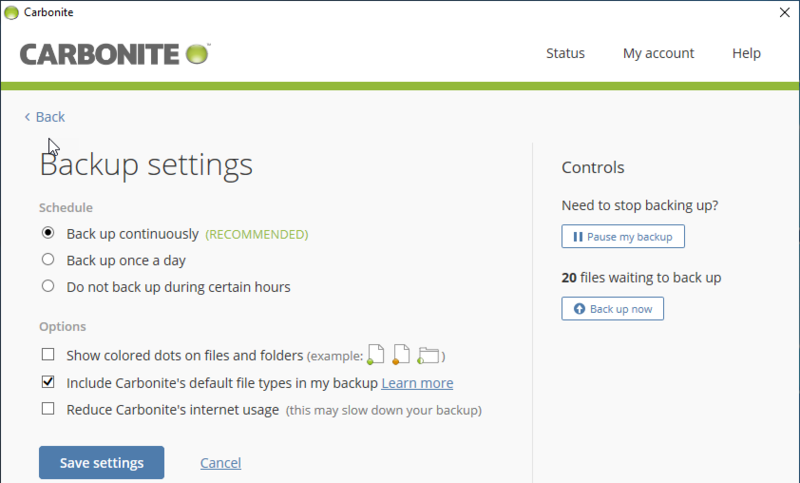 Carbonite is an extremely, extremely limited backup service. It’s like being downgraded from 1st class on Emirates to the baggage hold on a budget airline and being told it’s the same thing. It’s not – unless you’re completely deluded. You’re asked to pay a premium price for an entry-level product, and not even question why. Carbonite doesn’t offer me anything like the range of features I enjoyed with Mozy and combined with a laughably poor interface I’m now looking for a replacement. 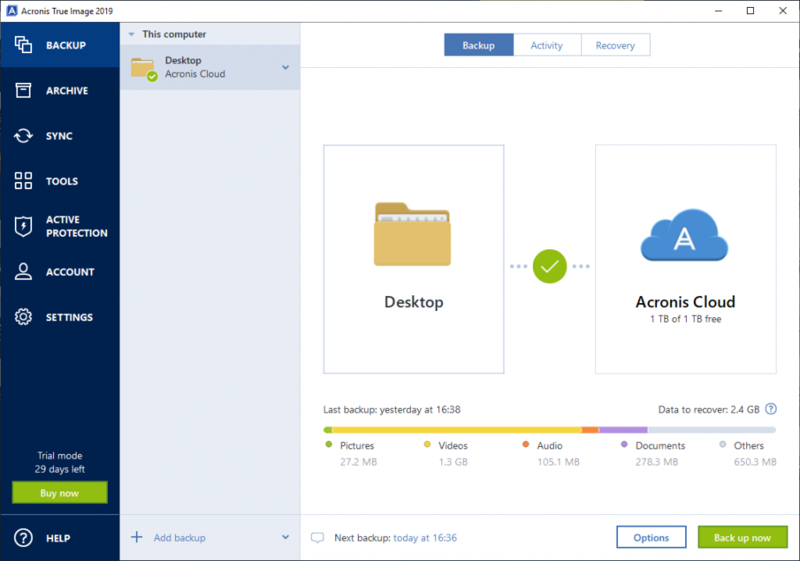 Right now I’m testing Acronis True Image and it’s a superior product in every way – I love what I see so far. But I did realize something – there aren’t a lot of options out there for reliable cloud backup services. Not only that, but 90% of the “reviews” you read are absolute BS – they’re just shilling for affiliate commissions by lying to you about which product is best. So, I might just take the time to review the most popular online file backup services in as much detail as I can and by doing some actual testing. Especially because I’m pretty sure my disappointment with being moved from Mozy to Carbonite is shared by tens of thousands of other people.